Yeah, I’ll admit it, I am on a serious Leap Frog habit. If you read my report on the Leapster, then you know what I mean. I definitely have to tell you about the LeapPad, a similar device as the Leapster. Like the Leapster, it uses cartridges, but it has no screen. Instead, the cartridges come with these spiral-bound books. 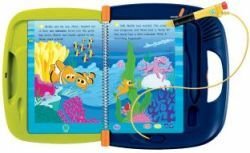 The books fit on the LeapPad, and then a child touches areas of the book with the digital pen. The LeapPad then reads to him from the storybook, or there are other options. For example, touching a certain spot starts a game where a kid must touch certain numbers to win. It’s almost as much fun for the parent. Makes you wonder where this toy was when you were a kid. Not only that, the LeapPad is completely educational. I wish I had some knowledge of how it works. I mean, it just boggles the mind how touching a page with a pen can produce some vocal reaction. You got to ask that old question: How does it know? I still can’t explain that to my children, who love this Leap Frog toy. Too bad the holiday season is over, or I would recommend this for parents with small children. The LeapPad just had a markdown to $19.99 from $24.99, and is available from the LeapFrog site.